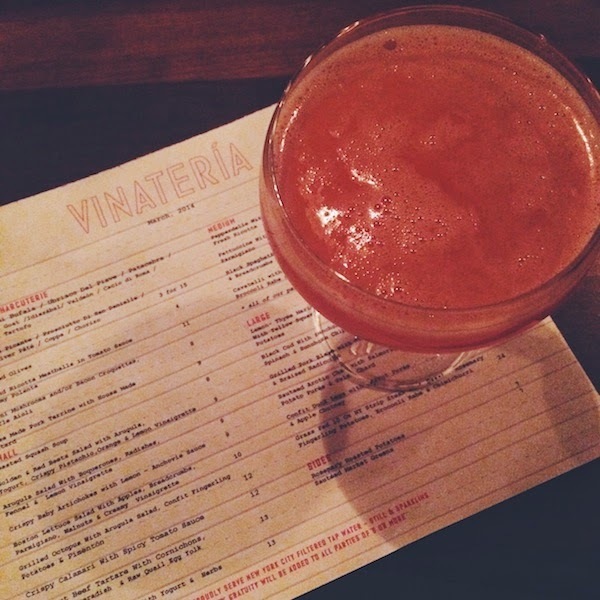 On our first night, my family went to dinner at Vinatería, a cool corner spot near my brother Luke’s apartment in Harlem serving seasonal Spanish- and Italian-inspired dishes. I’m not exaggerating when I say that we ordered almost everything on the menu, including the evening’s creative cocktail specials. My favorite dish: black cod with sunchoke purée and spinach. Bravo, Harlem. 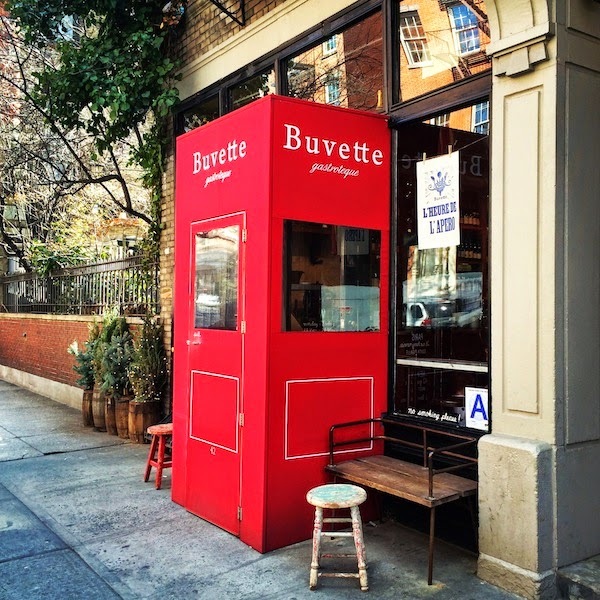 The next morning, Nick and I brunched at Buvette, which The New York Times calls “a miniaturized version of a true Paris cafe.” I’ll call it the cutest place ever. Everything about this West Village gem was adorable, from the red entryway to the cozy, rustic interior and illustrated menus with small-plate French fare (I had a perfectly petite bowl of lentils and kale topped with a poached egg). On the way out, you can toss a cork into the basket on a bike parked outside for good luck, in case you were wondering if things could get any cuter. Nick is really into the craft cocktail movement, so hitting up a speakeasy-style bar was at the top of our list. My friend Elena took us to The Flatiron Room, an intimate bar/lounge with a vintage vibe. 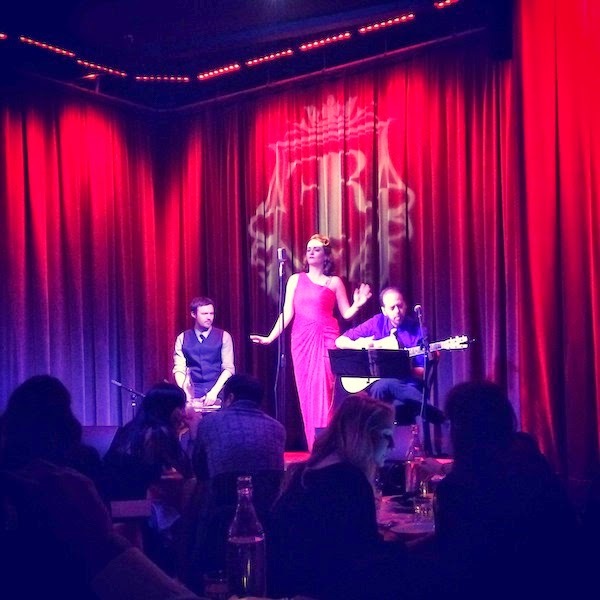 Picture chandeliers, red velvet curtains, comfy booths, and live jazz. The classic drinks still felt of-the-moment, like the whisky concoction that turned smokey after a few shakes in a sealed mason jar. “This is so Pinterest,” were Nick’s exact words. The next morning, Nick got up at 6 am to join the line that forms every morning at Dominique Ansel Bakery, home of the cronut. The croissant-donut hybrid that originated at this Soho spot has garnered such a following that locales and tourists alike line up hours before the bakery opens to get their share (there’s two-per-person limit). 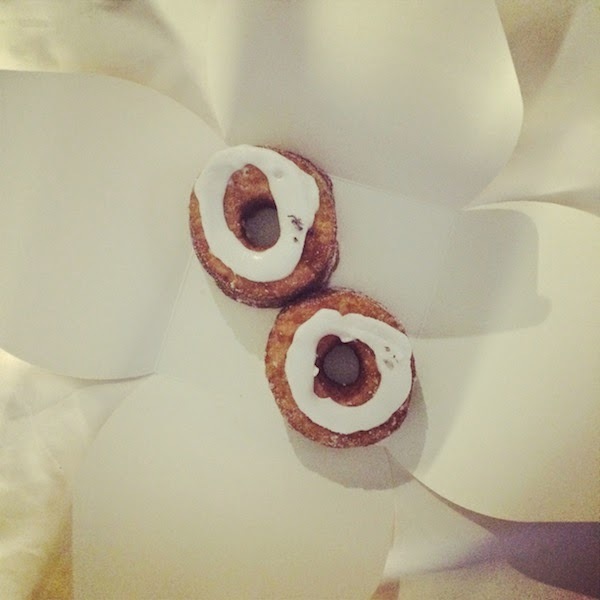 Thankfully, Nick brought them back to the hotel so we could have cronuts in bed. The flavor of the month was milk and honey with a hint of lavender, and totally worth the Nick’s effort. 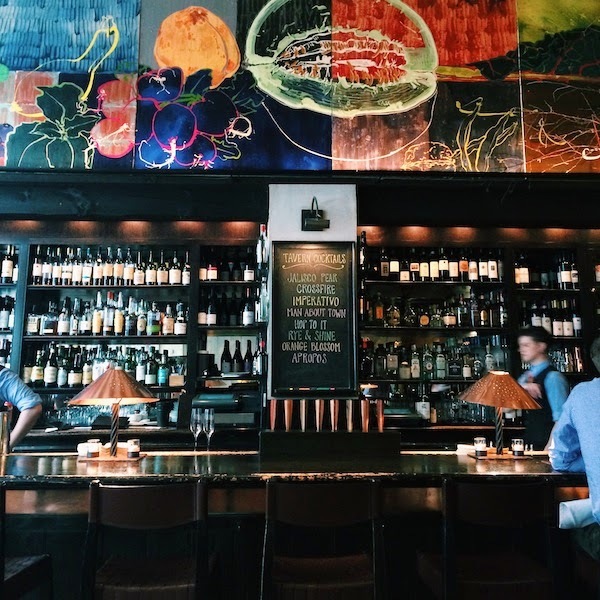 For lunch, we went to Gramercy Tavern, a Michelin-star restaurant that lived up to its reputation as a New York tradition. What’s great about coming for lunch is that the more casual tavern area is open. Standout dish: an appetizer of raw and roasted root veggies, artfully arranged on a slate slab and served with a trio of delicious dipping sauces. Later we passed a bus stop with an ad for a darling dress from H&M. “I wish I could wear that to the wedding!” I said as we passed the ad. Nick reminded me that I could wear that dress, since the Fifth Avenue flagship was only a few blocks away, and we had half an hour until we had to leave for the wedding. I booked it to the store, grabbed an even better dress, cabbed it back to the hotel and changed without a minute to spare. The dress was less than $12 (!!! ), making it the cheapest part of the whole trip. 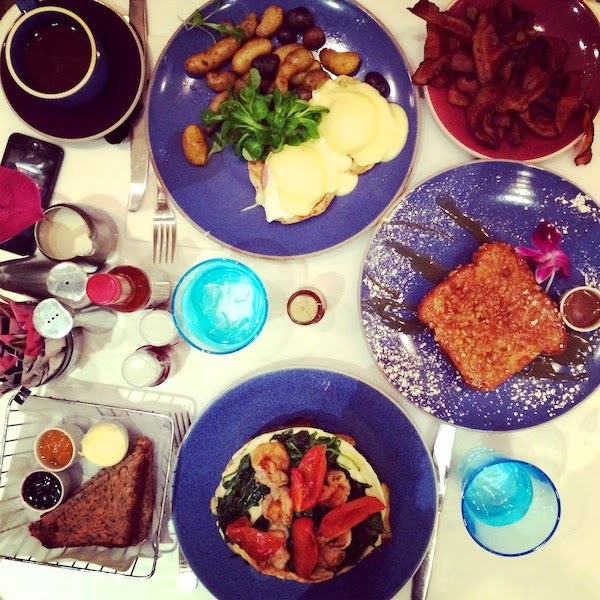 On our last morning, we went all-out at Norma’s at Le Parker Meridien, which has famously turned breakfast classics into decadent desserts. Think chocolate waffles filled with PB and toffee and ice-cream-topped French toast stuffed with cheesecake (these are real menu items, I swear!). Nick introduced me to Norma’s back in our early days of dating (smart man) and ever since, I’ve been wanting to return. We ordered the caramel-covered Crunchy French Toast (the crunch comes from a layer of Rice Krispies) along with some more traditional breakfast dishes. It was the perfect farewell meal, followed by a long walk in nearby Central Park to burn off a couple calories before hopping on the plane home. We’re already dreaming about going back. Do you have an all-time favorite spot in the city? I’ll be taking notes for our next trip!